It has come upon us once again to gather in our holy Ecumenical Council. After years of turmoil and tribulation, I invite you all to come and join together once more. The Sword Caine still has many issues to discuss and decide upon. The last year has been one of reflection for us. Now is the time to put such issues forward to the Consistory and move the Sabbat forward. As Sao Paulo Cathedral remains lost to us and Montreal was used when Mexico City was engulfed in war; This year I invite you all to come back home to Mexico City for Ecumenical Council. Come to the very heart of the Consistory and have your voices heard once more. This shall be our first real traditional Council in several years. Prepare your concerns for your council of Bishops and Archbishops to bring forward to us. Debate topics and concerns among your brothers and sisters. The Sabbat is home to us all. Though we may not all agree upon what that home should look like, now is the time to grow it once more. Issues of Ritae, Paths of Enlightenment, political concerns, and more are all to be discussed and brought forward. Ecumenical Council is what defines the Sabbat. To show the world we are truly free and we alone will stand against Gehenna. That we alone serve our Dark Farther Caine. So I invite you all to join in Mexico City this April 29th in the year of 2016 for our Ecumenical Council. Time moves, regardless of the will of those around it. This year, as it has in years before and will again in years to come, the Children of the Sword of Caine, the Sabbat gathers as one for the dark holy ritual that is Ecumenical Council under the noses of the residents of Mexico City. 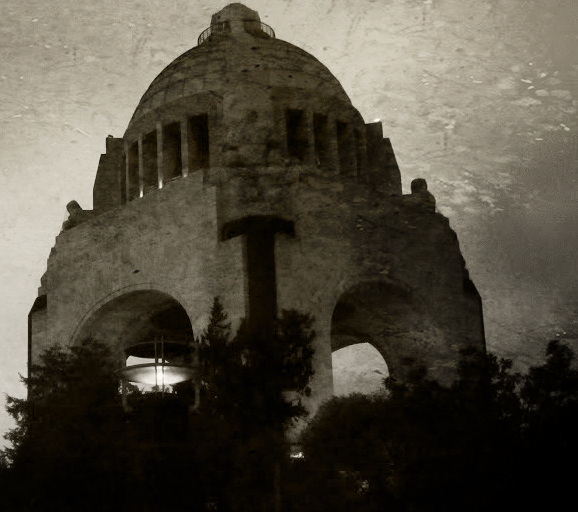 While there are many places suited to the needs and desires of the average Canite and the Consistory in Mexico City, none are as appropriate as the Monumento a la Revolución. A symbol of the Mexican Revolution, to mortal kind, it is a reminder of what the people of Mexico overcame to become what they are. For the Sabbat, it carries a much deeper meaning. In 1863, the Sword was shook to its core by the Second Sabbat War in this very city when Regent Gorchist was assassinated. The following conflict, that lasted until 1933, was brutal and cost the lives of many a brother or sister until that fateful day in December when the Code of Milan was formally acknowledged by the sect. The return to Mexico City, to the Monumento a la Revolución, has a further meaning to those Canites that are old enough or studied enough to understand its significance. The past year has been one of reflection and rebuilding after the end of the devastating 4th Sabbat Civil War. Brother turned against brother. Blood begot blood. Yet, in the end, the Sword managed to settle its disputes, elect a Regent and move forward. But as the dust began to settle, an ominous sign of the tribulations to come appeared, or rather, disappeared, from the night sky. Wormwood, the Red Star that appeared after the Week of Nightmares so many years ago has shattered. Quite simply, it broke. Regent Radu di Bistri himself has declared that this sign is proof that the end has begun. Some Canites agree, after all, there are prophecies that speak of the End. And yet, while noddists and scholars gather to discuss their interpretations, to help the Sword prepare for the War that is said to come, others cannot help but be skepctical. Only some texts, not all, speak of this phenomenon as a sign of the end times. Is it really a sign of the end times or yet another ploy by the Elders to destroy the Sword from the inside out? What, if anything, does this sign of Gehenna really mean? It is in this air of uncertainty the Sword of Caine gathers once again for a ritual steeped in both religion and politics. While it has always been true that the Ecumenical Council is one of the most important events for the Sabbat of the year, this year stands to make such statements even more true. Here, in the shadows of the revolution, on the steps once marred with blood, members of the sect will rise and fall. The very face of the Sabbat itself can be changed and shaped by one Cainite. It is spring. The cold winter is gone and what blooms from the barren earth is trully anyone's guess. Indeed, this is the first truly traditional Ecumenical Council in some time. Still, despite such feverent explosions of faith and growth, there lingers a sense of dread and fear. If the Red Star's destruction really does mean the end is coming, is something unseen now starting to make its move? The 4th year of EC is fast approaching and we of The Chaos Within are happy to welcome all of you to Springfield, Illinois to experience this fantastic event! Here is some information you might need to get ready! Columbus OH Grand Elysium 2017:These Violent Delights!